COLUMBIA, Pa. (CNS) — The Adorers of the Blood of Christ held a prayer service and reflection July 8 to mark the first anniversary of the opening of a chapel in a cornfield that symbolizes their opposition to the building of a natural gas pipeline on their property in Lancaster County. It also marked the first anniversary of the religious sisters’ federal lawsuit challenging construction of the pipeline. 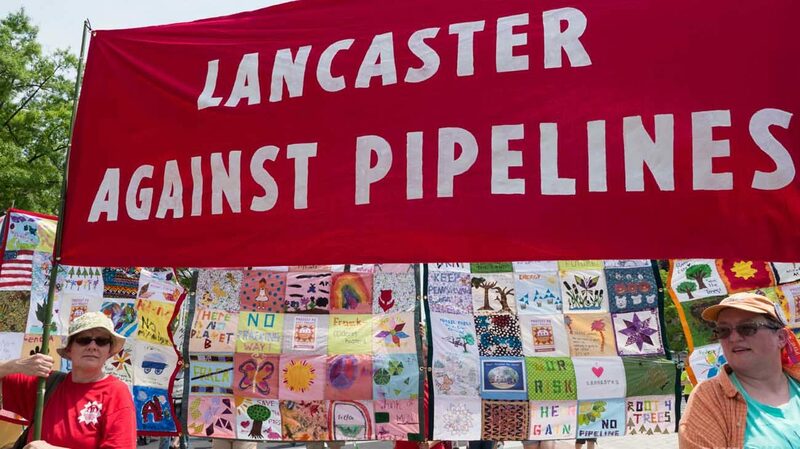 The chapel was built right along the proposed path of the pipeline by Lancaster Against Pipelines, a community group dedicated to opposing its construction. Made of four posts and several cross boards, the simple chapel is located just outside of the pipeline right of way. Several benches are available for people to sit, pray, reflect and talk. The Adorers hope that the chapel will draw people of all faiths to prayer and reflection about how land and other natural resources ought to be used. In addition to building the chapel, the Adorers have sued Williams/Transco, the company that would lay the pipeline, and the Federal Energy Regulatory Commission, which approved the company’s request to do so. The religious order said approval of the pipeline violated the sisters’ right to practice their faith under the Religious Freedom Restoration Act and they asked that it be rerouted. The Adorers argue that the presence of a fossil fuel pipeline on their property against their will would violate their deeply held religious convictions about the sanctity of the earth. In an October 2005 Land Ethic, the Adorers state that they honor the sacred nature of earth and all creation, seek to reduce fossil fuel reliance, and oppose environmentally destructive practices, such as hydraulic fracking. According to the U.S. Energy Information Administration, about two-thirds of natural gas production in the United States comes from fracking. Last year, a U.S. District Court judge dismissed the lawsuit, citing a lack of jurisdiction. The Adorers appealed to the U.S. Court of Appeals for the 3rd Circuit, located in Philadelphia, which heard arguments for the case in January. The Court of Appeals has not yet issued a decision. If it rules in favor of the Adorers, the case will be remanded to the District Court. The 183-mile pipeline, which is being built by Tulsa, Oklahoma-based Williams Partners, will carry gas from the Marcellus Shale in northeastern Pennsylvania to markets in the mid-Atlantic region.